The seating area of the Ara Vartanian boutique in London featuring mid-century Brazilian furniture and a wood table with amethyst legs designed by Ara and artist Hugo França. 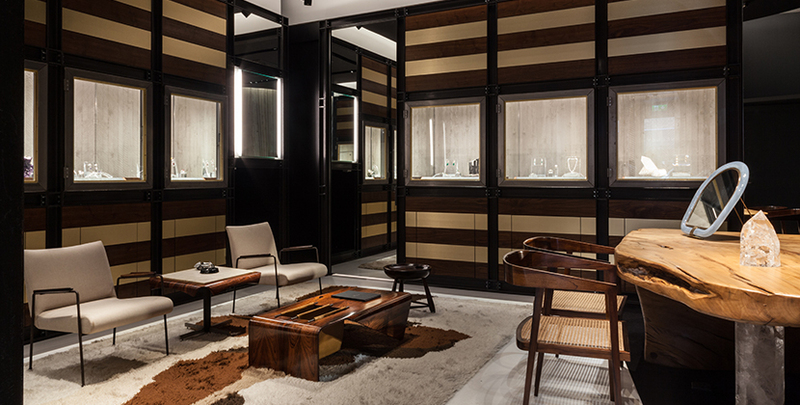 From the moment Kate Moss stepped into Ara Vartanian’s São Paulo shop in 2012 she was mesmerized. 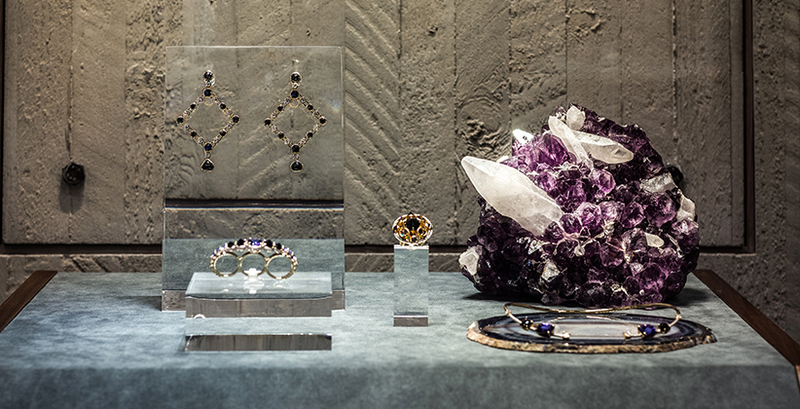 Ara specializes in one-of-a-kind statement jewels with a modern twist such as gems set upside down or inverted and extravagant double finger rings and enormous pendant earrings set with diamonds and big colorful stones. 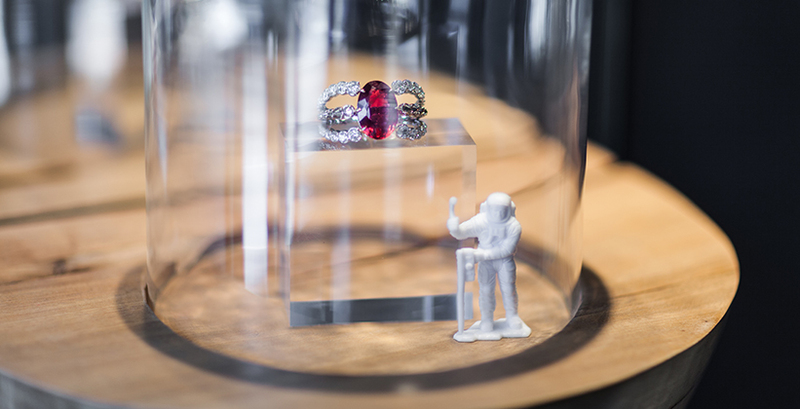 Kate immediately commissioned a tanzanite ring and formed a fast friendship with the charismatic designer. 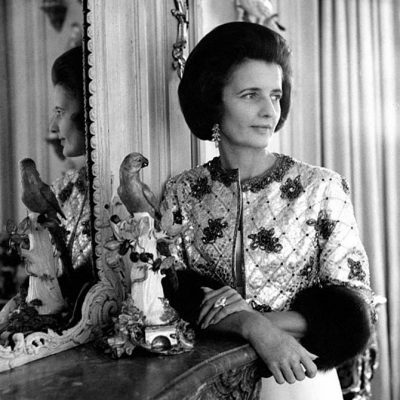 After receiving loads of attention every time she wore Vartanian’s jewels in London, Kate told Ara he should establish a boutique in her hometown. 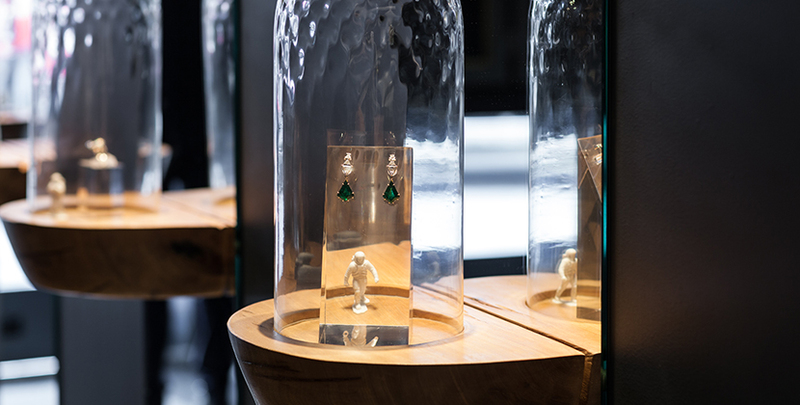 In The Adventurine’s celebration of Brazilian jewelry talent coinciding with the Olympic Games in Rio, we take a look at the beautiful shop that opened on July 25, 2016. 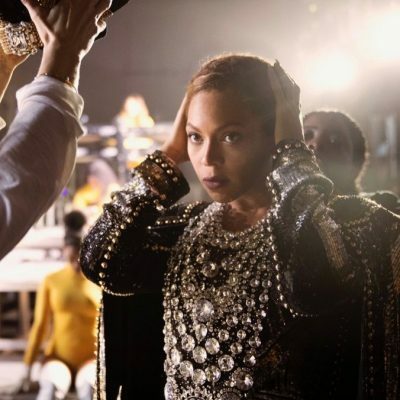 *Note: To advance the images above click on the photograph in the center on the far right. The Mayfair location at 44 Bruton Place just off Berkeley Square is a part of a building that was once Baron Maurice Saatchi’s home. 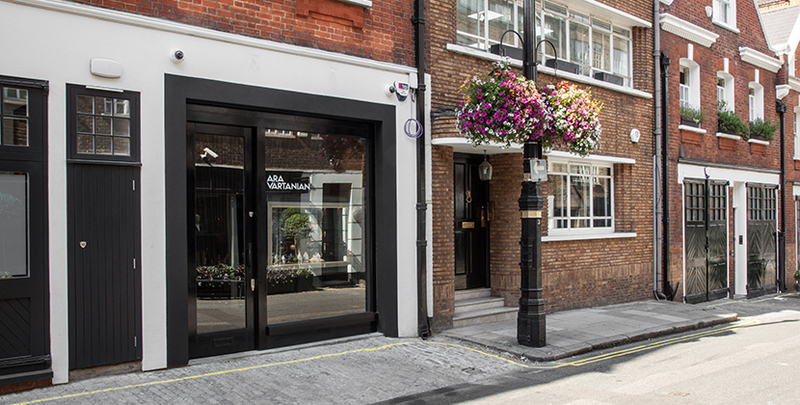 Ara Vartanian’s boutique marks the first time the property has been used for a retail space. The new façade compliments the style of elegant English neighborhood while the interior, conceived by Ara and Estudio Tupi Architects, has the same stylish spirit as the Vartanian locations in Brazil. A 1920s Brazilian construction technique called Béton Brut was used to form a concrete wall with areas carved out to display jewelry. 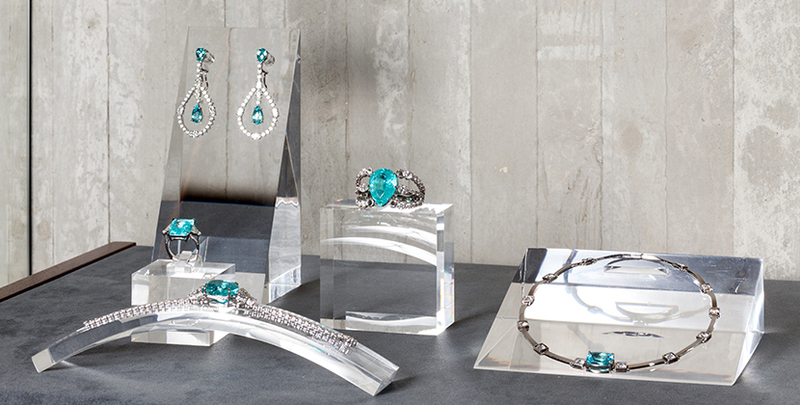 The industrial material creates a modern contrast with the sparkling gems. 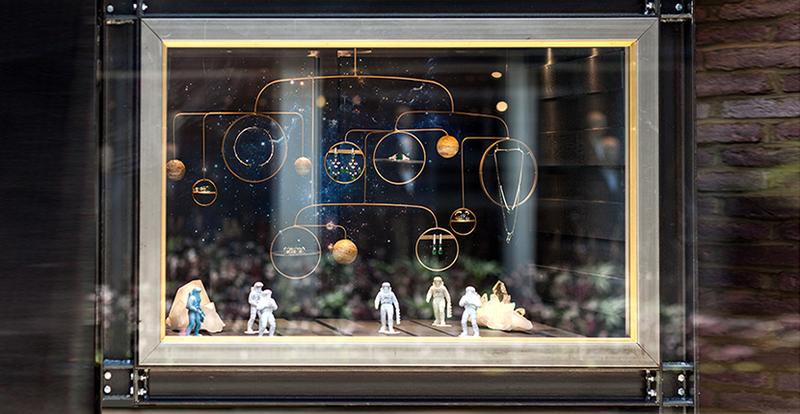 Little astronaut figures on display within several of the vitrines provide an element of whimsy. They make an appearance mainly because Ara likes them. He enjoys the symbolism of space travel and connection to his name which is the same as a constellation positioned between Scorpius and Triangulum Australe. 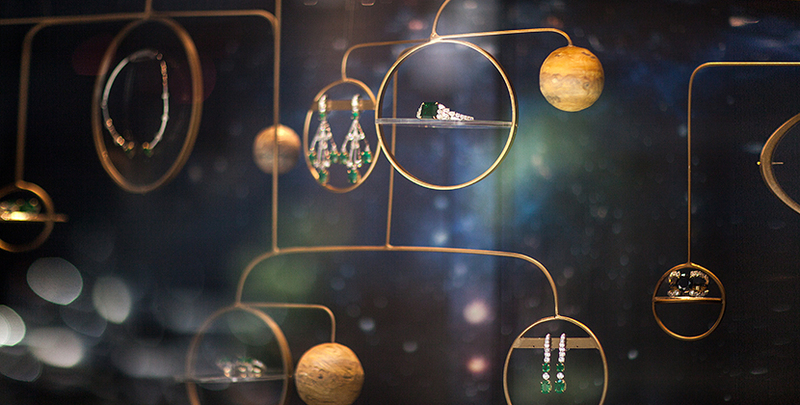 Another nod to the solar system can be seen in the planets hanging among the jewels in the window display. Almost all the furniture in the store, personally chosen by Ara, is Brazilian vintage made by designers during the fifties and sixties who featured handmade details in their work including Zanine Caldas, Jorge Zalszupin and Sérgio Rodrigues. A table in the seating area was designed by Ara and artist Hugo França who is known for his Furniture Sculptures. The tabletop is made of reclaimed 100-year-old wood from the Bahia region of Brazil. Carved crystal forms the table legs.